We appreciate your donation. Please click the DONATE link button below to donate through Paypal. If you do not have a PayPal account you can still donate via a credit card. There is no charge to you. As you complete your transaction, you will be re-directed back to the AHCO web site. You will have an opportunity to let us know if you would like your donation set towards anything special, examples such as new truck fund, building fund, marching club, general account. Or you may specify in honor of a past member or special event. We would appreciate if you could leave your name so we may read your donation off at our company meeting. 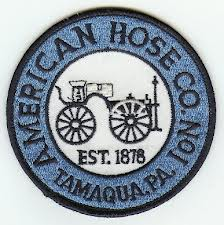 The American Hose Co #1 is a 501(c)(3) tax exempt organization. All donations are tax deductible, however, the 501(c)(3) status grants additional privileges. Charitable contributions made to qualified organizations may help lower your tax bill. Click HERE for more information. Additional information can be located HERE, or on the web. We encourage you to speak with your accountant as to the benefits of donating to our organization. After your donation, please complete the online form and we will provide you with a letter of recognition of the amount of your donation as well as our 501(c)(3) information for your tax purposes.